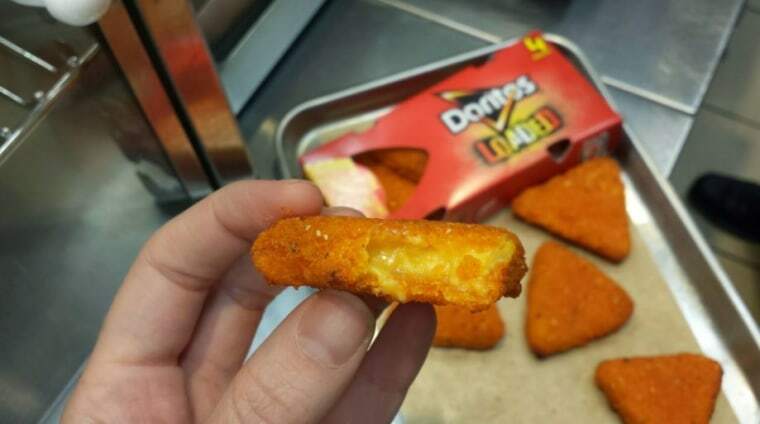 While our cups runneth over with salty, cheesy, fatty drunk food, there is indeed something new to crave and then hate ourselves over the next morning: Doritos Loaded – fried cheese patties with a Doritos Nacho Cheese flavored crust. The guilty pleasure snack is rolling out at 7-Eleven nationally July 2, after it was offered in a few test markets. It’s 7-Eleven's move toward becoming a food destination, capitalizing on the popularity of Doritos Locos Tacos. “Our research indicated that the warm cheese center was highly motiving from a guest purchase intent,” a spokesperson for 7-Eleven told TODAY.com. Warm cheese center… mmmm…we’re feeling motivated already. So is it worth a try? We got a sneak preview, and in two words, OH YEAH! The triangular patties are served piping hot, so take it slow before you burn your mouth on the first bite. The Doritos crust is salty, crunchy and intensely cheesy in that chemical-y Doritos way. It has a blast of flavor and is the perfect snack after a night of partying. It's not refined and is terribly unhealthy, but wow is it tasty. It’s worth the walk of shame you’ll be doing out of 7-Eleven – and conveniently, it’s portable, so you don’t have to do that walk alone.